How Can a Runner Heal a Plantar Plate Sprain? Regardless of what some doctor calls it, they are all basically a sprain of the plantar plate ligament. The very first stage of a plantar plate sprain involves inflammation within the plantar plate ligament and the joint capsule. You have to remember that the plantar plate ligament is a thickening on the bottom of the joint capsule where your toe attaches to your foot. 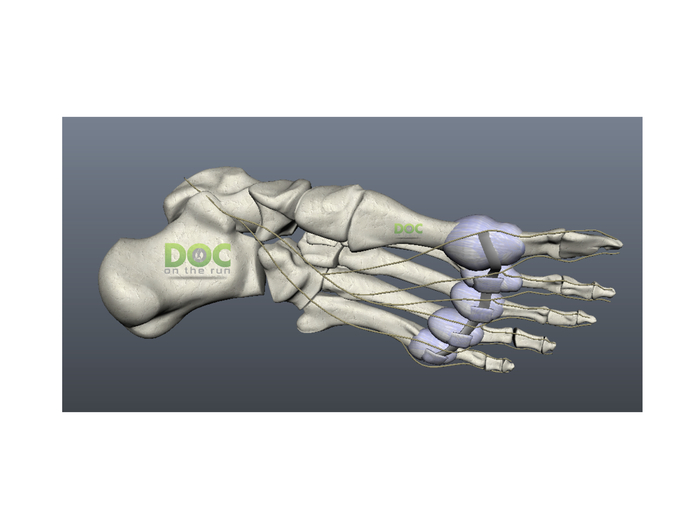 Because that joint capsule connects the proximal phalanx bone in the toe with the metatarsal bone in your foot, doctors call it the metatarsophalangeal joint. But the specifics and technical terms are not important. 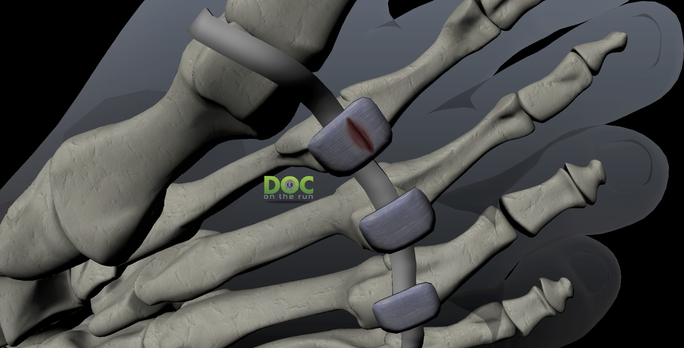 What is important is that you realize you can get swelling of the tissue that lines that joint. That tissue is called synovial tissue. The synovial tissue actually makes the synovial fluid that lubricates the joint and nourishes the cartilage within the joint. When that tissue swells, the ball of foot can feel sore or puffy and swollen. Sometimes it just feels like there’s a lump underneath the ball of the foot. Some runners just say it feels like there is a sock bunched up under the foot. All of that discomfort and weird sensations are mainly because there is swelling within the joint capsule, it can be pretty easy to calm it down pretty quickly. Sometimes the pain you feel when you press on the plantar plate ligament is actually because the plantar plate ligament is injured. But a whole lot more of the pain is because there is swelling within the joint and when you push on the foot it hurts that swollen tissue. If that’s your case, that’s a really good thing. If you aggressively treat the inflammation and you get a rapid improvement, then you know most of the tenderness is from the swelling. If most of the problem is related to swelling you may only have a minor injury to the plantar plate itself. If you’re aggressive about treating the inflammation and you get very little improvement then your doctor would probably assume you have a more significant tear in the plantar plate. But let’s talk about what happens when you treat the inflammation and the swelling rapidly subsides. If you’ve been aggressive about doing the contrast bath routine, you’re wearing compression socks, you are elevating and you are doing many of the other things we talk about to reduce inflammation and your discomfort goes away then it’s probably safe to start exercising. You can do the contrast bath routine. 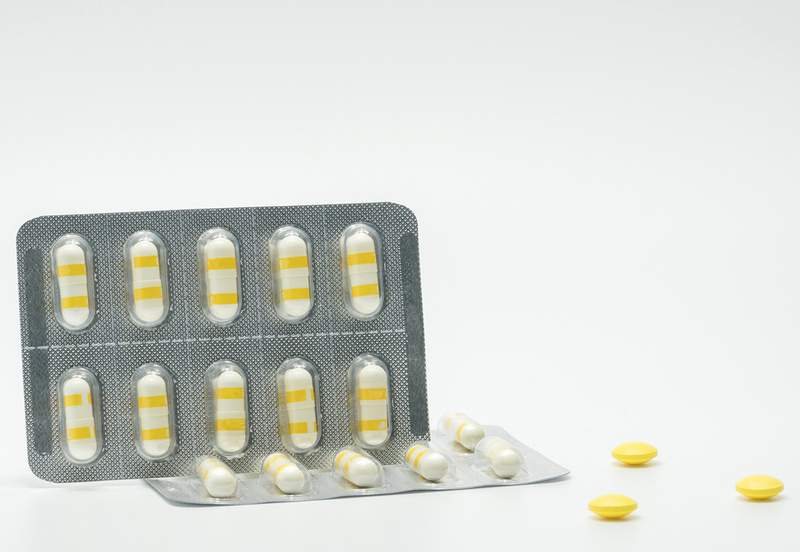 You could take anti-inflammatory drugs like Ibuprofen or naproxen, but for a number of different reasons I don’t often recommend non-steroidal anti-inflammatory drugs for most runners when they get a sprain of the plantar plate. Non-steroidal anti-inflammatory drugs have been shown to impede healing of structures made of collagen. The plantar plate is nothing more than a thickening of the joint capsule. The plantar plate ligament and joint capsule are mostly made up of collagen. You don’t want to do anything that might inhibit collagen production. You need to do the opposite. You need to rebuild collagen! So even though it may seem reasonable to think an anti-inflammation drug might be a good thing when you have inflammation, these pills are best avoided when you have a plantar plate injury. We created a separate lessons that actually shows you the specifics on each of the recommended strategies to reduce the inflammation. Make sure you check those out. The first benefit of reducing inflammation is that you are going to have less pain. Less pain is a good thing for many reasons. Most importantly, when you stop the inflammation, you have less inflammatory fluid around the injured plantar plate. The inflammatory fluid contains degradative enzymes which are supposed to break down collagen. Since collagen is one of the primary building blocks of healing during the initial stages of any injury, you have to make sure you are not slowing down the initial healing process just by having all that inflammatory fluid soaking and eroding the healing plantar plate. 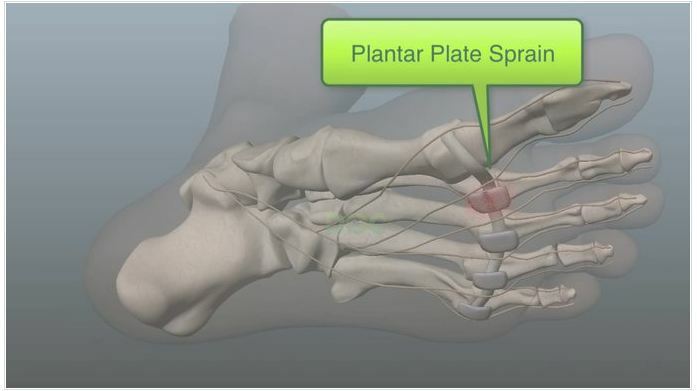 Every plantar plate sprain is different. If you’re younger, you’re going to heal faster. If you’re older, you’re going to heal slower. Most people understand and except that as fact. But what most doctors don’t seem to want to accept is that a mild plantar plate sprain will heal a whole lot faster than a severely torn plantar plate. They don’t all take the same time to heal! If you just have some inflammation around the plantar plate ligament or within the joint reinforced by the plantar plate ligament, you may completely calm it down just by doing all of the things I teach to reduce inflammation. But don’t think treating the inflammation just means taking a pill because I don’t think that works. The more things you actively do to reduce the inflammation and get that fluid out of the ball of the foot, the faster the plantar plate sprain is going to calm down. If you have a plantar plate sprain we presume there is a rip, a tear, or a split in the plantar plate ligament. Although most people think they should get an MRI to look at the plantar plate sprain, you don’t always get to see the full extent of the damage. The slices on the MRI are so far apart that sometimes the MRI can miss the tear. And in other cases the soft tissue inflammation can look really bad and may be unnecessarily alarming. So an MRI will not always give you an accurate picture of the problem. An MRI will also not really help you decide whether or not it’s safe for you to run when you have a plantar plate sprain. As an aside, I think some runners who get pain in the ball of the foot which a doctor has diagnosed and labeled a “plantar plate sprain”, it’s not really a sprain. Technically the ligament is not really torn. It’s just an inflamed joint capsule. If you just have some swelling in the joint capsule connected to the plantar plate ligament you don’t really need to heal the plantar plate ligament. You just have to calm down the joint. You get a little tear in the plantar plate ligament and the plantar plate ligament bleeds. You get a blood clot that forms between the ends of the plantar plate ligament in that little tear. The blood clot starts to solidify and turn into this plastic-like material when it congeals. It is sort of like glue repairing the tear in the ligament. You start getting little strands of collagen forming within that blood clot. Those little collagen fibers reinforce the glue and support the tear in the ligament making it much, much stronger. The newly formed collagen fibers start to stabilize the tear in the plantar plate ligament. At that point you start to have a lot less pain because injury site has so much collagen stabilizing it that the plantar plate ligament doesn’t even hurt when you move or push on it. The second phase of healing which involves the actual rebuilding and repairing of the plantar plate sprain does not begin until the inflammatory phase is over. So that again just points to the fact you have to get rid of all the inflammatory fluid first. You need to make sure you have a diet which will support the healing process. Collagen is a type of protein. 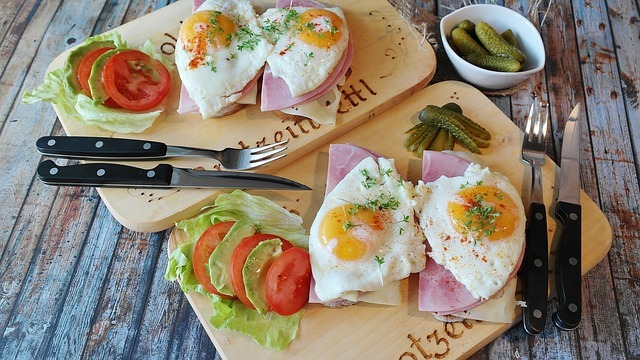 To build protein in your body you need to eat protein and have collagen in your diet. If you eat lots of meat you probably get enough of this. After you get some stability and a little initial healing around a plantar plate sprain, your body will start to turn the ligament healing site into a stable, strong plantar plate ligament. During this process of collagen formation and maturation of the plantar plate ligament, you have to make sure you don’t do anything to disrupt the healing. One warning: plantar plate sprains can being extremely frustrating and notoriously difficult to heal. Part of the reason they can be so difficult to heal, is that runners get fooled into thinking the ligament has healed. If you think about it, when you get a little bit of immature, weak strands of collagen stabilizing the little tear in the plantar plate it starts to hurt less. It hurts less just because it has a very small amount of collagen fibers holding it still. If you walk on it in soft cushy running shoes or if you push on it gently with your fingers it doesn’t hurt. But it isn’t fully healed at that point. It’s only stable enough that it can tolerate you pushing on it with your fingers or walking on it in cushy running shoes. This is a common problem at around 4 to 6 weeks into recovery process. For many runners a plantar plate sprain will show initial signs of healing around 4 to 6 weeks. The runner gets tricked into thinking that the problem is solved. You sit on your couch and you push on the foot and it feels like it’s okay. So the next day you put on your running shoes and take off on a run. And during that run, you step on it just the wrong way, you pull apart those tiny little strands that were holding the sprained ligament together and just like that you are back to square one. A good rule of thumb for most runners is to give it an additional two weeks of healing before you run on it. What I mean by that is if you push on it, if you walk on it, if you’re evaluating it and it seems like your pain is completely subsided, wait two more weeks from that point before you run on it. Make no mistake… more than any other doctor on the planet I want to give you permission to run! I want you to run as soon as possible. But there’s nothing more frustrating to a runner than losing weeks of healing time and having to start over. So make sure you know how to truly evaluate the strength and stability of the plantar plate before you run on it. Make sure it is sufficiently healed so you don’t lose all of the time you invested in the healing process. If you’re running on it every week or so, just to do a “test run” to check it out and see how it feels, you’re just going to be ripping apart all of the immature collagen fibers. Obviously that’s going to slow down healing. Now that doesn’t mean that you can’t maintain your fitness. And it doesn’t necessarily mean you have to quit running entirely. You just have to make sure you are not disrupting the healing process. Don’t forget, whatever you did, whether it was running hills, running stairs, running on uneven surfaces, spending too much time on the elliptical trainer, doing too many lunges at the gym, doing too much of anything that stressed the plantar plate before your body could fully recover…you did something that injured that little ligament. If you keep doing the same thing, you can expect the same result. You can expect the plantar plate to get worse. Now, obviously you’re not going to keep doing the same thing while its injured, because it would hurt. But to get the plantar plate to completely heal you definitely need to have less stress on the plantar plate than you did when you injured it. So you have to do something to decrease the motion that would apply stress to the plantar plate. You have to do something to decrease the pressure applied to the ligament to let it heal. Immobilization just means you are holding a body part still so can heal. Offloading means you are taking pressure away from one particular structure to reduce the stress, so it can heal. The most effective form of offloading is using crutches. If you don’t put your foot on the floor and you don’t walk on it, you don’t stand on it, obviously there’s no pressure at all. But that’s not going to work for a runner! Sometimes doctors think of “not running” as a form of “offloading” just because you are applying less stress to the foot once you stop running. Of course, ”not running” doesn’t really work for runners either. The point here is that you should think of relative immobilization and relative offloading. If you use shoes that are stiffer and have a curvature under the ball of the foot which prevent the toes from bending and decreases the stress to the plantar plate ligament, that’s a form of relative immobilization. If you tape the second toe to hold the toe still and decrease the stress and strain to the plantar plate ligament, that’s a form of relative immobilization. If you modify pads and place them underneath your shoe insert to take pressure away from that particular plantar plate ligament, that’s a form of relative offloading. When you want to heal a plantar plate sprain, you really have to focus on all the different strategies and ways you can decrease the motion, decrease the pressure and decrease the stress to the healing plantar plate ligament. We discuss all of this in vivid detail in the rest of the lessons in the Ball of Foot Pain Course for Runners and the Plantar Plate Course for Runners. 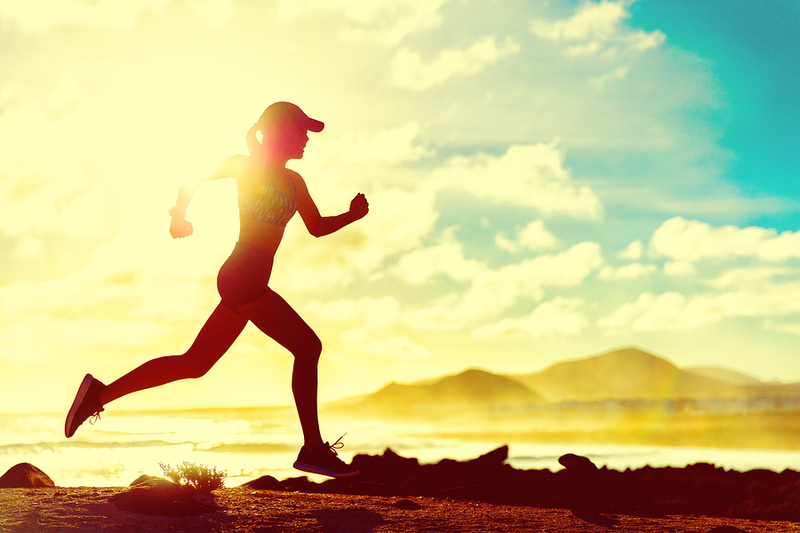 Make sure you go through those lessons so we can walk you through all of the different strategies you can use as a runner to decrease the stress to the plantar plate. Again, if you want to run and you want the thing to heal you just have to make sure that the total amount of stress applied to the plantar plate is low enough so you are below your threshold for healing. Make sure you get the building blocks in to rebuild the collagen. Reduce the stress, pressure and motion and allow it to heal. Then, monitor your symptoms closely. If the pain is going away you’re on the right track! If your swelling and lumpy sensation is going down you’re on the right track! Once you’re on the right track, start ramping up your workouts so you can stay fit. The goal should be to maintain your running fitness, keep ramping up activity, while your symptoms keep going down. Make sure you understand the ways to heal and get back to running. And above all else, make sure you know exactly how to evaluate the strength of the plantar plate ligament yourself so you don’t undo the healing that’s taken place by starting to run prematurely. You have to be very careful about that. But if you do all of those things. If you’re cautious, if you’re diligent about this, you can heal your plantar plate injury and you can get back to running.